The feature should have a staged roll out, slowly ramping up the number of edits that the jobs are run for. Throughout the time of the roll out metrics such as number of jobs in the queue etc should be monitored. Throughout the rollout we also need to check the cache status and cache eviction rate, we probably can't fit results for all entities in the cache.. The job will only really take full effect when T204024 is also done persistently storing the data. Beta and test can probably be deployed quickly / in the same day (if everything goes fine). wikidata.org should probably not proceed any faster than 1 increase per day. • Addshore changed the task status from Open to Stalled. This needs constraint checks to be setup on the beta cluster and testwikidata before we can proceed. This in itself is an interesting thing to need, as without a query service for testwikidatawiki or beta testing this outside of production will end up not testing the "full" functionality. This one is still blocked on T209957 and T209922 being complete first. Patches for the stages described in the ticket have all been created. Yep, that was patched with the above backports. So, the increase to 25% of edits triggering jobs seems to be adding between 2 and 2.5 jobs per second to the queue (estimation prior was 1.6-4.1). Job concurrency is now at about 6. So getting this to 100% without hitting the limit should be no problem. I appears there is so no deduplication happening yet, probably down to the fact that we are only at 25% so edits to the same entities in rapid succession may not currently be getting jobs triggered, the queue is also staying empty and jobs are being processed in 1-2s. The QPS on the wdqs-internal cluster has increased from 50ops to 150ops due to the increased number of constraint checks. Regarding deduplication it may be worth adding a delay to the jobs using jobReleaseTimestamp from the mediawiki job definition to slightly delay the job execution giving more chance of deduplication from consecutive edits. After checking with @Gehel the QPS on the wdqs is not too important, instead we should just be looking at the load. Load didn't increase much so that is a good indication that we are fine to continue from the wdqs side. If the wdqs is struggling it will return 429s and quality constraints will throttle, so that's all we need to keep an eye out for. However, those 50 slots are shared between many jobs types. That's why we created https://gerrit.wikimedia.org/r/#/c/mediawiki/services/change-propagation/jobqueue-deploy/+/484773/ - to be deployed today. Change-Prop now has a separate rule for this job, so it doesn't interfere with low-traffic jobs. The concurrency is set to 30, which should be enough, however after deploying 100% we need to monitor the lag and increase concurrency if we see the job is steadily lagging. Aaah, now that I didn't know! 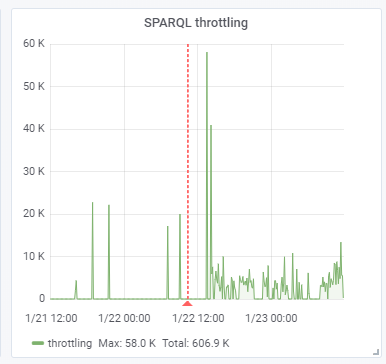 So checking back at how this is affected WDQS, we started getting throttled queries. 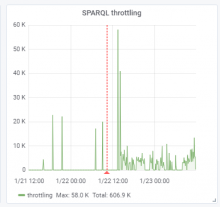 So we will pause and assess the situation and see if we can reduce the number of queries. Going to move this to stalled on the campsite board for now as we can't move forward with this directly. Going to un assign myself from this for now but leave it in the camp board stalled column, we need to put some more tickets through the camp before we can turn this up a bit more.